Shed My Skin – Out Now! Dan Navarro is the perfect troubadour. He carries the load on his back; mile after mile, block after block wearing out the soles of his shoes. His songs speak; for they will make you cry, laugh and think and they resonate. From his childhood days in the California-Mexican Border to the streets of L.A. and NYC, Dan has heard his fellow artists’ cries and is adamant about his passion making sure they have a fair share in the ever-changing music business world. His duet with blues-soul singer Janiva Magness, “You Drove Me Crazy” (touted as a prison duet), is a Spanish flavored waltz about two starry-eyed lovers lamenting over their failed romance, “you drove me crazy, and now I am going to stay that way.” Dan is a full-blown romantic for sure, and this seals the album with a kiss. Growing up at the California-Mexican border, Dan spent his childhood learning how to live in between the lines. Lines that came in various forms – physical, emotional, and mental – continuously moving about – drawing from his artistic well. He moved back to Los Angeles, enrolled at UCLA and left after a few years when the musician bug bit. So, Dan took the job as a buyer at Tower Records where he learned about the retail side of the record business, and by night he played at the local L.A. songwriting clubs. In 1980, Dan decided to spend a year in London working with the management company for the British rock band, The Moody Blues. When his year was up, the legacy with songwriting partner Eric Lowen, began at baggage claim upon Dan’s arrival: “…he picked me up at the airport, and we walked straight into a partnership that lasted for almost thirty years. Pretty much until he passed away in 2012,” Dan recalls. During this 30-year history, the two songwriters spun gold with songs like “We Belong,” and when Pat Benatar recorded that, they went from 0 to 60 mph with their careers. The duo continued to have songs covered by pop-rock-hip-hop-folk genre artists like; The Bangles, Dionne Warwick, Keb’ Mo’ and Nile Rodgers (Chic, Madonna) that top a lot of different charts on Billboard, radio plays and celebratory reviews. The duo continued to make wonderful music, and it’s a part of Dan’s life that he cherishes the most. “There’s before-Benatar and after-Benatar in terms of how I lived.” Dan laughs at the pivotal time of his young life. “And there’s before-Eric and after-Eric in terms of how I performed,” he adds. Dan also found his way into voice-over work and scored huge when he got hired by Seth McFarlane to be a returning voice for the long-running, animation series, “American Dad” and “Family Guy” on Fox TV. He has expanded to video games, short films, commercials, and full-feature movies, like “Happy Feet,” “The Lorax” and “Pirates Of The Caribbean.” His most beloved song, “El Perro” sung by the character ‘Cilantro’ the rude mariachi, on Fox’s series, “American Dad” is now one tune that has made its way to his live shows as a crowd favorite. 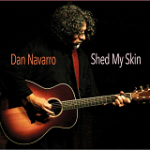 Dan Navarro has a voice for a lot of characters, but most honored and treasured one is being involved with the ongoing issues with music and all its entanglements on the legal side. He has served on boards from Folk Alliance to SAG-AFTRA (the merged Screen Actors Guild and American Federation of Television and Radio Artists), the Recording Academy, The Levitt Pavilions in LA, and more. But his most important piece of law is the Music Modernization Act, so all creative kindreds are paid what they are worth through the new platforms like Spotify, iTunes and other non-traditional avenues of distribution. Navarro has appeared in Washington speaking about artists’ rights and intellectual property issues, on behalf of Nashville Songwriters Assn Int’l, SoundExchange, SAG-AFTRA, musicFIRST Coalition, BMI and The Recording Academy, including testimony before the Senate Judiciary Committee and the Copyright Royalty Board. Dan currently serves on the national and local boards of SAG-AFTRA and the AFM/SAG-AFTRA Intellectual Property Rights Distribution Fund. All in line to hopefully to regain creative control for the artist in the areas of copyright and royalty payments. If it is true that, as we shed our own skins, we cycle through a thousand lifetimes, then Dan Navarro has lived the lives of a thousand men so far. Those are stories we should all hear.